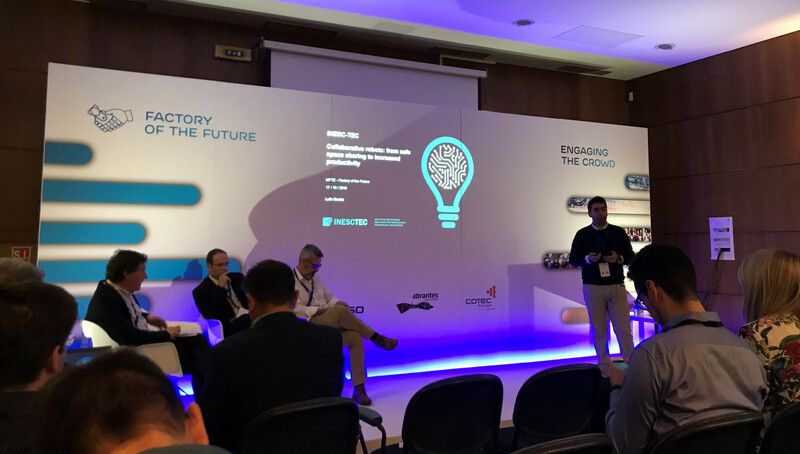 The researchers of INESC TEC’S Centre for Robotics and Intelligent Systems (CRIIS), Luís Freitas Rocha and Rafael Arrais, were present in the event «Factory of The Future», which was promoted by Mitsubishi Fuso Truck Europe (MFTE) that took place between 16 and 17 October in Abrantes. INESC TEC’s participation consisted in Luís Rocha’s presentation entitled «Collaborative robots: from safe space sharing to increased productivity». It was based on a research line of several years that was dedicated to collaborative robots. This presentation was made in order to explain the audience what the collaborative robotics in the industry 4.0 perspective is actually about, and its difference from the more traditional industrial robotics solutions (and their security systems), showing their advantages and disadvantages and seeking to raise awareness on the need for prior evaluation of the productive process to automate in order to select the most appropriate robotic technology to the problem. This initiative, which was composed of a cycle of conferences and several technological demonstrations on Smart Factory and Industry 4.0 topics, provided round table discussions and exhibition of speakers from leading companies in Innovation, from the main technological clusters and from higher education institutions specialised in the Fourth Industrial Revolution. The programme also included a market place, which was set in the factory area, aimed at involving the collaborators in this debate. In addition to the staff of MFTE, the recipients of this event were mainly high-tech companies that work with digital transformation. Everyone had the opportunity to debate ongoing technological innovations in the world, which can be applied to the factory of MFTE, and to take a further look into the matter of the innovation and industry 4.0. MFTE, which is located in the village of Tramagal in Abrantes, is one of the factories of the FUSO brand and it’s responsible for supplying vehicles to more than 30 European countries.